Explore our Rado selection – a varied and prestigious collection of the world’s finest watches. We’ve been a Rado partner since the shell suit was in fashion in the mid-80s. 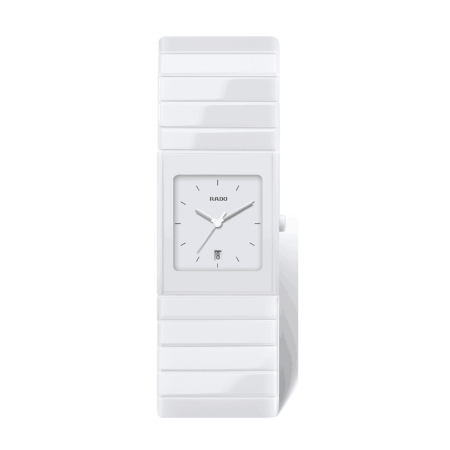 So we witnessed the launch of Rado Ceramica in 1990: a modernist masterpiece in high-tech ceramic. Unlike neon polyester, the Rado Ceramica has stayed in style ever since! It’s an iconic watch. The sculpted high-tech ceramic was futuristic at the time, and the modern aesthetic has lasted. This is a watch for the fashion-forward and vintage-lovers, the retro chic and the style-setters. How was the Ceramica conceived? Back in 1986, Rado introduced the use of high-tech ceramic, launching the Rado Integral. ‘High-tech’ ceramic was only used in medicine and space technology at the time. It’s harder than steel but also lightweight and hypoallergenic. Inspired by the amazing new material, Rado designed the Ceramica in 1990. The watch case and bracelet are seamlessly integrated, giving additional strength and a cool, urban look. The result is an incredibly robust watch that’s light and easy to wear, featuring Rado’s impressive movement on the inside. 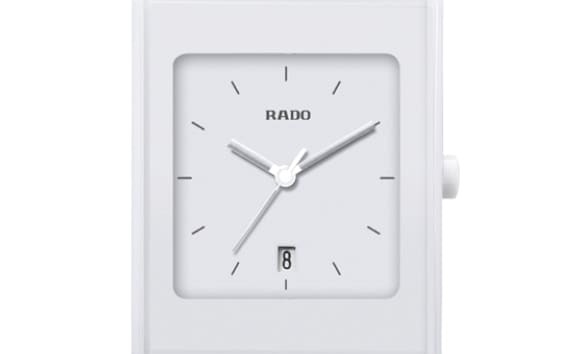 Rado is a family watchmaker founded by three brothers in 1917. Since the 1950s, Rado was synonymous with innovation – introducing first water-resistant, then scratch-resistant, watches to the industry. In 1986, the first watch made from high-tech ceramic “exploded” into the market. This material has proven extremely successful: in 2015, Rado introduced a chocolate-brown metallised colour (the latest in a range of shades). They’ve also introduced other innovations such as a dual timezone dial and ‘touch and swipe’ setting on the Esenza Touch. You’ll find all of our Rado favourites on the website. Try them on by coming to our welcoming showroom in Green Street, EL7. If you’re looking for a particular model then give us a call for latest availability.